Religious Identity in Adulthood: Is It Who You Are Or What You Do? Last week I posted about my ongoing struggle to forge a religious identity as an adult by borrowing from different faiths. Today I continue that discussion of religious identity in adulthood – with a particular eye towards Jewish identity – over on PoliticsDaily.com. It’s a question directly raised in a landmark decision by Britain’s Supreme Court, which ruled last Wednesday that it was illegal for a state-funded Jewish school to base its admissions policy on whether or not the applicant’s mother was Jewish. And so the thorny question arises that bedevils all of us who struggle with religious identity, but particularly Jews: whether our identity is determined fundamentally by what we do or by our blood. 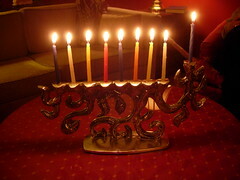 Image: Metal Menorah by Skyco via Flickr under a Creative Commons License. Although the immediate family of my childhood was more-than-usually (for observant Catholics)broad-minded about religion & most other subjects, I certainly knew enough extremely narrow, even bigoted people to acquire a lasting distaste for absolutist purists of any persuasion.